Why do I need to season a cast iron skillet? What oil should I use to season a skillet? How do I re-season or rejuvenate a skillet? 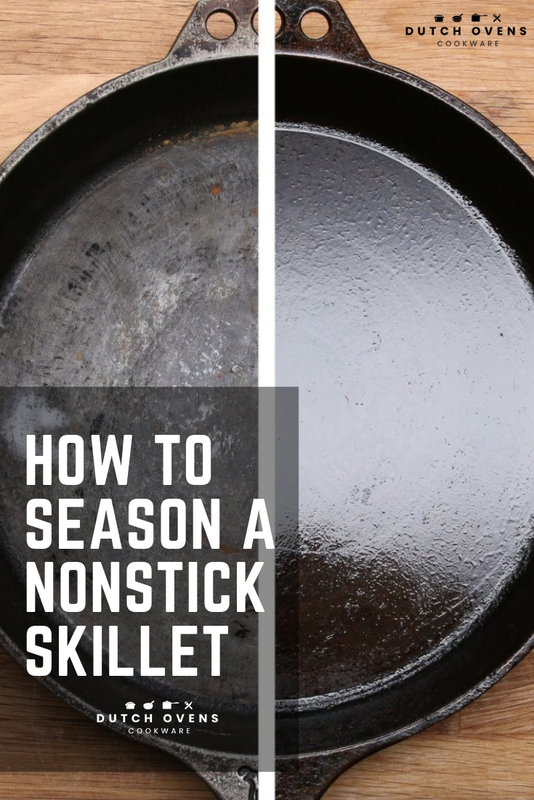 Today, you will learn how to season a nonstick skillet and why. It’s important that you do this as soon as possible. This is an important process. Failure to season your cast iron results in rust. Therefore, it renders it useless and it’s a lot of work to save it from the scrap heap. A seasoned skillet is a maintained skillet. It is a joy to cook with so spend a little time to do it properly. Remember, cast iron cookware can last for generations so a little effort every now and again is a great time investment. Before we move on to how to season a nonstick skillet, we need to tell you why. The reason is simple. Cast iron is porous which means that it will absorb liquid. This means that it will start to rust if this is allowed to happen. In order to prevent this, you need to add a grease patina that will stop liquid absorption. This is done through the process of seasoning. Before i tell you how to season a nonstick skillet, let us consider what oil to use. 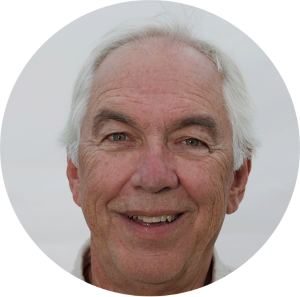 The oil we choose needs to have a high smoking point which is the temperature that the oil starts to break down. Not all oils are the same. The refined oils I have listed have high smoking points and are ideal for the seasoning process. Unrefined oils such as olive oil and sesame oil have lower smoking points and also contain very strong flavoring. This makes it inappropriate to use for seasoning. The manufacturers apply a coat of wax or oil coating when the item is produced. This is done to prevent rust while the item is held in stock or during transportation. It also makes the cast iron look appealing to retail customers. It is there for a purpose but do not confuse it with seasoning. It is not and it needs to be removed before you actually season it for the first time. You will need to use steel wool to remove this layer. Take your time and do it properly as failure to remove it may impact on the seasoning process. This process is important before you start to preseason a new cast iron skillet. Fill your sink with hot soapy water. Scrub your pan in the water using steel wool or a scouring pad. Rinse thoroughly and dry it with a clean towel. The skillet is now ready to be seasoned. There are essentially two methods that you can use to season your cast iron skillet. The method you choose is up to you and will depend on what you have access to. Personally, I always use the oven based method as it is more thorough and the heat delivered is more consistent. This is just my preference but I have used the stove top method successfully too. Obviously, I am assuming that you have already removed the manufacturers protective coating. Here is the process you need to follow in order to season your cast iron skillet using an oven. You will need to rinse the skillet thoroughly and wipe it down. You then need to leave it to air dry. While it is drying, turn your oven on and preheat it to 350 degrees Fahrenheit. Once the oven has heated to the correct temperature, place the skillet upside down in the center of the oven. You need to keep checking but when it is too hot to handle, remove it from the oven. This initial process is designed to open up the pores in the cast iron. It also removes any moisture that may be held within the cast iron. You need to apply your first layer of seasoning. The choice of oil you use is up to you, personally, I use vegetable oil. You need to cover the whole skillet with a layer using a clean paper towel. Remember that you need to keep it clean and ensure all of it is covered including the handle. Basically, any exposed cast iron. You then need to return the skillet back to the oven and bake it for an hour at 350 degrees. Remove the skillet after an hour and add another layer of oil. The skillet then needs to return back to the oven. Bake for another hour. Once the hour is complete, remove from the oven and add a third layer of oil once you have left it to cool. There you have it, the oven method of seasoning a cast iron skillet. This is a less time consuming method but is adequate. You should always opt for the thorough oven-based method in the first instance. You will need to rinse the skillet thoroughly and wipe it down. 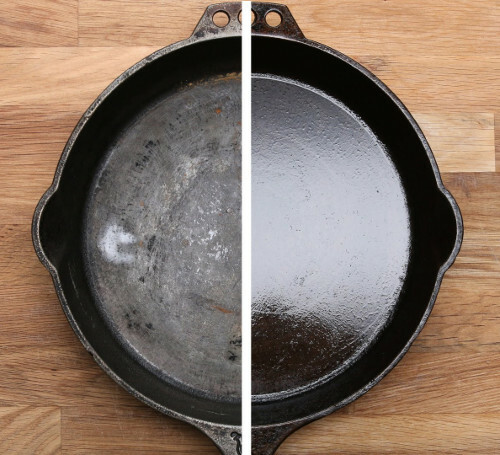 Once dry, apply a layer of oil on any exposed cast iron. Heat the pan on the stovetop over a medium heat. Do this for 2 minutes. Once the skillet has cooled, wipe of the excess oil. The seasoning is complete. A sign of a well-maintained pan is shown in the color. Over time, it will blacken. This tells you it is well seasoned. If your pan shows any signs of rust, you need to re-season it as soon as possible. Once you have followed these processes, you have a skillet that should be protected from rust and have a non-stick surface. Submerge in water – you are encouraging the cast iron to take on moisture. If not dried properly, surface rust will form. Put it in a dishwasher – far to harsh and the cleaning agents will strip the seasoning. Use a scourer to clean it – again, far to harsh. You will remove the seasoning and open the pores of the cast iron. This encourages moisture to be held in the iron causing rust. Burn the seasoning off by using high heat whilst empty – you should use low to medium heat only. High heat simply causes the seasoning to burn. Not dealing with rust quickly – it will spread and leave you with a headache and hours of work ahead. Always better to prevent rather than have to deal with these kinds of issues. Never cut anything in the pan, transfer to a chopping board for any cuts. You need to follow the exact process I have outlined above. If there is no seasoning on the skillet, I would recommend the oven based method. It is more thorough and will add layers of seasoning. If you are basically looking to top up the existing seasoning, then the stove top method is more than adequate. It is important that you let any cast iron cookware cool properly. Do not be tempted to run it under a tap to cool quickly. 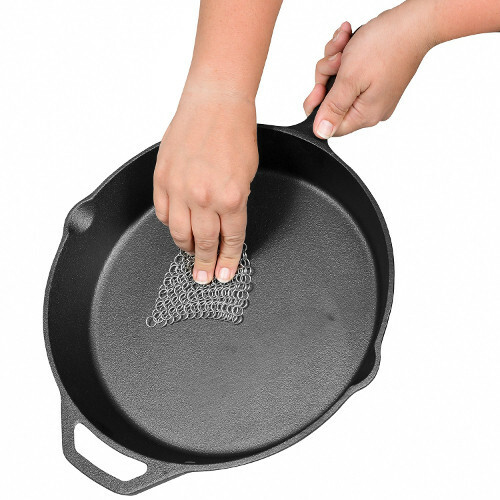 It will result in thermal shock which will leave your cast iron skillet warped, cracked and ruined. Storage is just as important as the seasoning to maintain your pan. It is recommended that they are stored on a hanging rack with plenty of space between the items. If you are storing it in a cupboard, it is important that you place a piece of cloth between items. This will prevent them scratching and damaging each other when you move them. The restoration process is pretty much the same as the seasoning process. The difference obviously is the level of rust on the damaged pan. In most cases, this will be surface rust that needs to be removed before you can undertake the seasoning. Do this using steel wool and water. This may take some time and effort but the results are well worth the effort. This process is simple in comparison to cast iron seasoning. Simply rub some vegetable oil or cooking oil onto the ceramic surface. You then need to put it on a stove top at medium heat for approximately 2 minutes. Allow it to cool and then wash it in warm soapy water. Allow it to dry properly. Your ceramic pan is now seasoned and should perform better than ever. I have addressed how to season a nonstick skillet in detail. It is an important process that needs to be undertaken with care. Take your time and do it properly. It is well worth the effort as when it is seasoned properly, it is just a case of maintenance in the future. Failing to season a skillet properly means that you will run into rusting issues and you will find food sticking to the pan. You also need to be aware of what you are buying before you undertake this process. Trust me…season your skillet properly and it will last for generations. Where do i buy the best Skillets at the lowest prices? It would be really great if you could share this image on Pinterest…it’s just a couple of clicks for you but it means a lot to us here. There are two things i love in life...camping and food. What better way than to put the two together and cook outdoors. Put simply...i'm all about the outdoor life.